This article goes over features found under the Reports tab, in the Training section of the console. Read the below guide, or watch our Monitoring Training Campaigns video, to learn more about this topic. There are additional reporting features available under each of your individual training campaigns. See here to learn more. 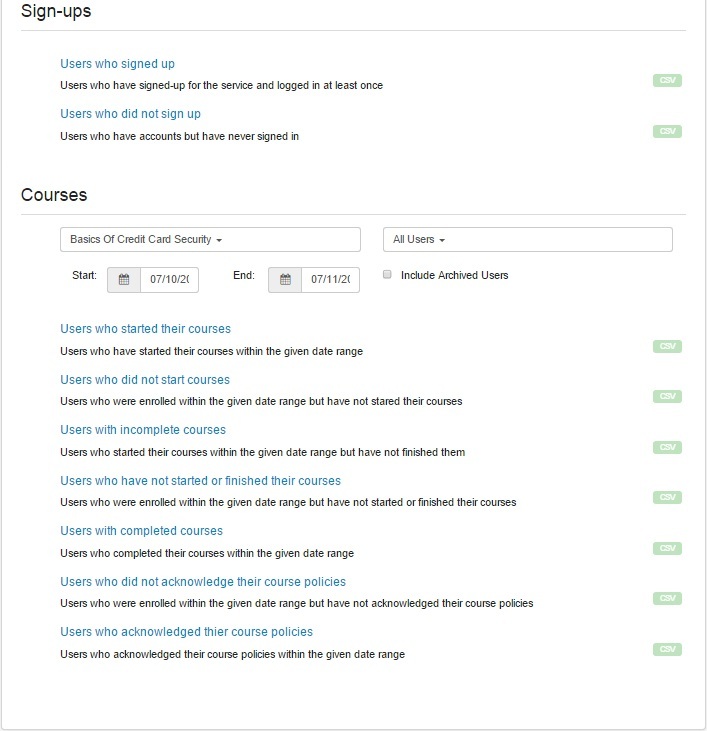 In the Reports area, you can track your assigned courses, and see at a glance how many users have or have not fully completed the courses. Users who Signed up and Users who did not sign up: These reports cover which users have created an account (as opposed to just being imported), and which users have not created an account for the purpose of completing their assigned training content. You can download a CSV file for either of these reports by clicking the CSV button to the right of the report title. You could refer to the email addresses in the CSV to re-send those same users the signup link, which is located on your account Dashboard (shown below). Alternatively, if these users are enrolled in a campaign, you can initiate a notification from the console, from within the campaign overview page. See here for more information on manual notifications initiated from the console. The courses section holds various reports for training modules and games. The reports are filtered by the items you select in the Courses drop-down menu. You can include a start date and end date to limit the report to the specified time period. You can also filter the reports by choosing one or more groups in order to generate info about that group’s progress through the selected course(s). Checking the Include Archived Users checkbox will include any users you’ve deleted from the console in your report. If this checkbox is not selected, any users deleted from the console will not show up in the reports. You can download a CSV file for any of these reports by clicking the CSV button to the right of the report title. Note on policy acknowledgment reports: These reports are for employees who have and have not acknowledged course-attached policies. This method of policy acknowledgment is not to be confused with our Policies feature, which enables you to upload your organization's policies and assign them through training campaigns. See our How to Create and Manage Policies in Your KnowBe4 Console article for more information. How Can I Engage My Stakeholders in My Security Awareness Training Plan?